This week, H&M on Fifth Avenue will become more of a Jeff Koons art exhibit than a clothing store. This unconventional art exhibit will be showcasing Koons' special-edition bag for H&M, a leather bag with his famous balloon dog on it. This is a big deal for both the designer and the company, as it marks H&M's first collaboration with an artist. It's also the perfect introduction to his brand new exhibition at The Whitney, "Jeff Koons: A Retrospective," which opened on June 27th. Koons' collaboration with H&M is a strong reminder that art is fun, art is accessible, and art is wearable. 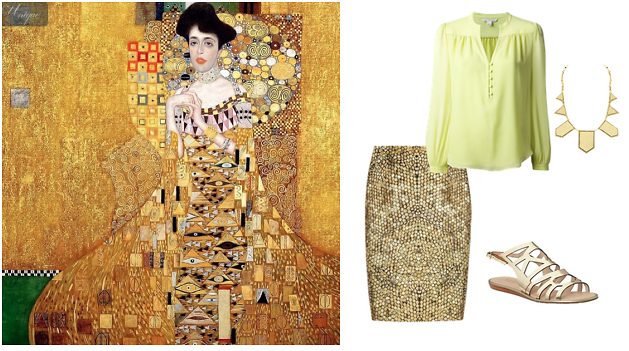 To honor this exciting partnership as well as his new exhibition, we've found some outfits that look like famous works of art for you to try yourself! Be sure to buy the Jeff Koons bag at H&M and visit his incredible exhibit at The Whitney.